In mid-February 2019, the UK House of Commons Treasury Select Committee heard from UK financial services providers about the problem of ‘money mules,’ reported to be on an upwards trajectory(1). The term ‘money mule’ is very familiar to financial crime risk professionals, denoting an individual used by criminals, knowingly or not, to transport illegal funds. The term is of course fraught with value judgements; being ‘mules’, they are perceived at best naive and unwitting accomplices, and at worst willing and able conspirators. However, as those giving evidence noted, ‘mules’ although enabling financial crime, can often be victims too. Money mules can present challenges for FinTechs, especially those offering account based services and payments, because their customer base often draws on groups targeted to become mules: the young, immigrants, the economically precarious. This post explores the mechanics and consequences of money muling, and asks what can be done to mitigate the problem. In part, we believe that the answer is robust financial crime risk management; but FinTechs can also play an important educational role in preventing the vulnerable falling into the ‘mule’ trap. Europol, the European Union’s (EU) law enforcement agency, defines money mules as ‘people who, often without knowing it, have been recruited as money laundering intermediaries for criminals and criminal organisations(2).’ The term is sometimes used interchangeably with ‘smurfers,’ although this latter term more precisely refers to those who deposit many small batches of illicit funds to avoid a threshold of regulatory interest. The mule wires the funds to another account(s) at the direction or request of criminals. This often includes cross-border transactions. The mule receives a ‘commission’, either separately or as a cut of the funds sent to their account. There are of course variations upon this modus operandi, and criminals have also been known to ask the mule to transfer electronically the funds to another account, without the withdrawal at stage (C). Like any money laundering typology, muling will evolve with the development of technology and institutional requirements. Criminals will often pose as reputable organisations, in order to convince the target that what they are doing or proposing is legitimate and legal. Some may present themselves as representatives of an overseas firm whose details are difficult to verify. Other criminal gangs use techniques such as impersonation and role-playing, presenting themselves as an authority figure, such as police officer, government official or soldier, seeking help in some awkward personal circumstance, often requiring the transfer of funds overseas. An 27% increase in the number of 14-24 year olds being used as money mules. Many of these young people were students, promised substantial payments for little effort. An 11% rise in the number of accounts believed to have been used by money mules (32,000 plus in total)(5). In the UK, young people are also increasingly becoming the targets of identity fraud, leading to the misuse of their accounts by money launderers. At the Treasury Select Committee hearing, representatives from Santander noted that the young were particularly vulnerable to having their accounts being used for muling without their knowledge because so many of them take a lax approach to data security; according to Santander’s research, 85% of 18- to 25-year-olds had shared financial information online(6). The consequences of becoming a money mule can be harsh, even if the mules are not aware of the ultimate rationale behind the transfers. Regardless of their level of knowledge, they will have played a crucial role in a financial crime, and as such are liable to criminal charges in most developed jurisdictions. In the UK, for instance, muling can lead to a prison sentence of up to fourteen years; in June 2018, the UK group Financial Fraud Action reported on a case of a 26 year old man sentenced by a London court to a year in prison for two mule transactions that totalled at £28,000(7). Even if criminal charges don’t arise, there is still the risk of long-term financial exclusion and limitations on career prospects. In April 2018, the BBC reported on the case of an anonymous teenage girl, ‘Holly’, who had been targeted by online mule recruiters, or ‘Fraud Boys’ as they are known, on Instagram and Snapchat, but had been caught out by bank staff when depositing a large amount of cash into her account. According to the report, Holly has struggled to get a bank account since, and has had to ask her employers for payment by cheque, which can only be cashed - at substantial cost - in payday loan shops(8). Young people and students are attracted to products designed specifically to appeal to their needs, many FinTech products are seeing significant traction amongst this demographic. Other groups such as new immigrants or those seeking access to financial services might also be attracted to using online services which do not require lengthy verbal interactions with in-branch bank staff and offer products that are designed to address the imbalance of financial exclusion. Criminals are aware of these developments, and it’s possible that they will focus increasingly on the recruitment of FinTech customers, particularly as other routes, via traditional institutions are closed off for them. This highlights the increasing need for close collaboration and joint working between financial institutions of all types to combat this type of crime. The first consideration is awareness of the issue, and factoring it into your risk assessment and appetite. If your firm is focused on building a client base in the vulnerable demographics, then you need to make sure you explicitly recognise the risks and have the right controls to manage the nuances. 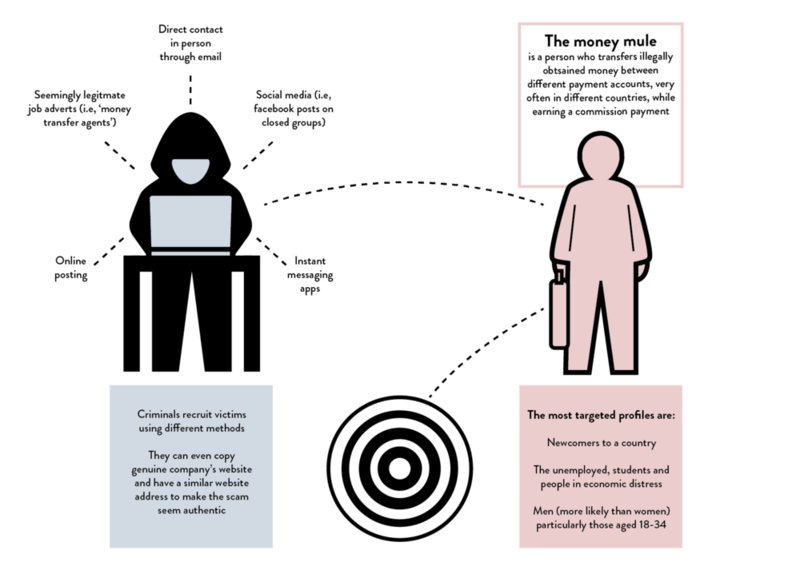 Every firm and product is different, and there is no generic approach to this, but it is worth recognising that it is difficult to identify all mules at onboarding, especially as some will onboard legitimately, being recruited as mule later (if you’re offering a product aimed directly at improving financial inclusion for example). This can be made harder if ‘at risk’ groups are part of your target customer segments. However, gaining a thorough understanding of the client during the Know-Your-Customer (KYC) phase and building that customer profiling in to a tuned customer risk assessment is a key to detecting problems later on. Because it is in the context of their expected behaviours that we judge what is unusual. Unlike legacy banks, FinTechs are not going to catch mules out ‘in branch,’ as happened to ‘Holly’, mentioned above. Transactions take place online, so it’s important to have monitoring tools in place that can alert you to deviations in normal behaviour, along with an appropriately trained team to investigate those alerts and report them through a Suspicious Activity Report (SAR) if necessary. Utilising available data to identify and robustly investigate ‘at-risk’ accounts is a key control activity. Mule accounts are sometimes maintained through linked life-style payments to add an air of legitimacy so investigating account connections and leveraging data points such as common addresses (and others) can be a powerful way to proactively identify accounts for further review. Additionally, building a suitable greylist or using industry databases such as CIFAS (or others) can provide a mechanism of detecting suspicious profiles at onboarding. Research suggests that accounts used during the later phases of mule activity in a network are more likely to be used by criminals more than once, presenting an opportunity to detect them via robust data sharing and blacklisting. Prevention is often better than a cure so an important additional approach is to think about how FinTechs can help prevent the problem in the first instance. Reducing the pool of potential mules is a more cost effective ‘up-stream’ solution than tackling the effects of their activities. It also provides an opportunity for anti-financial crime professional to add something back to the community with clear positive social impact. FinTechs have a unique advantage in the way they interact with their customer base and can play an important role in educating particularly vulnerable clients - especially young people - through explicit guidance during onboarding and throughout the customer lifecycle. Companies can engage in and support anti-muling campaigns, such as the EU’s European Money Mule Action (EMMA) imitative, or the ‘Don’t be Fooled’ campaign by the UK groups CIFAS and Financial Fraud Action (FFA)(10). And if it sounds too good to be true - it is. Walk away or ignore them. If you would like to discuss the issues in this post, or wider anti-financial crime topics in an increasingly digital FinTech world, please feel free to get in touch with one of our team or at contact@fintrail.co.uk.